I tried to come up with a creative/catchy title for this post. But I think simply the name says it all. Pumpkin. Cream Cheese. Truffles. Need I say more? We’re having a little Sweet Treat Potluck at work for Halloween, and needless to say I’ve went a little bit overboard with treats I want to make for it! I found this recipe the Whole Foods website, and I knew I already had ALL the ingredients, so I really couldn’t resist. The mixture is really soft, and I highly suggest putting it in the fridge before for 30 minutes or so until you roll them into balls. I used my smallest Pampered Chef cookie scoop to form uniform balls, and put them on a wax paper on a cookie sheet. I knew the mixture was still pretty soft (especially once I’d rolled the last truffle), so I put the cookie sheet in the freezer for an hour or so. When it came time to dip them, I just cut the wax paper and only took out 5-6 balls at a time. This helped them stay cold & solid before dipping them in the hot almond bark. These were a hit at the party, and a hit with The Boy, who doesn’t share my love of pumpkin everything! Yield: Approximately 18, depending on how large or small you roll them. **The original yield I had for these was 30, but I have revised that to 18, as you could get 30 (and I have in the past), but they would be rather small. Since the popularity of cake balls in the past few years that cake balls came onto the scene, people expect the size of these truffles to be larger and more similar to the size of a cake ball. Melt the 1/2 cup of white chocolate chips in a double boiler over medium-low heat or in the microwave for about 1 minutes. Stir often to keep the chocolate from burning. Transfer to a large bowl. 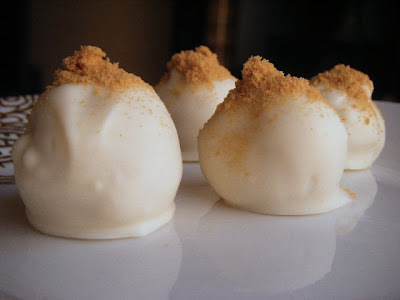 Add gingersnap crumbs, pumpkin, graham cracker crumbs, sugar, zest, cinnamon, salt and cream cheese and beat with an electric mixer until smooth. Transfer to a shallow bowl, cover and chill until just solid enough to roll into balls, about 2 hours. Line a large sheet tray with parchment paper. Melt remaining 2 cups white chocolate almond bark and transfer to a small, deep bowl. Roll 1 heaping teaspoon of the pumpkin mixture into a ball in your hands, then drop into the chocolate. Working quickly, gently spoon chocolate over to coat. Using a small spoon or fork, lift the truffle out of the chocolate, shake off excess and transfer to prepared sheet tray. Dollop a bit of extra chocolate on any parts that remain exposed, then sprinkle a few gingersnap or graham cracker crumbs over the top, if you like. Repeat process with remaining pumpkin mixture and chocolate, then chill truffles until chocolate is completely set, about 1 hour. MMMMM…. how were they??! I’m so jealous Liesl! I want some of these badly. These are so pretty – they look like a perfect little one-bite dessert! My suggestion for saving your poor hands next time . . . maybe use a #40 spring-loaded ice cream scoop? I use mine for cookie dough, meatballs, even mini-muffin and mini-cupcake batter – works great with sticky stuff. Better than freezing your fingers off! Thanks so much for sharing this recipe and your lovely pics! These look so absolutely delicious and perfect for the fall! Wow, these look good!!! Now… I’m not a pumkin fan… could the pumkin puree be substituted? Your truffles look sooooo delisious. yum yum yum. Hey, those sound gooooood. I’ve not seen or heard of them made with anything other than just crumbled up cake and cream cheese frosting. Bet all those added ingredients sent them right over the top! Great photos! OHHHHH my gosh! I’m not kidding, I love these so much I JSUT added them to my TG menu. They look FABULOUS!!! Hi, great post! I would love to get permission to use this recipe on my About.com American Food site. I will link back of course. Can I get permission? Sorry, but couldn't find your email! I want to give these a try! Thanks for directing us over here. OMG these look amazing! The dinnersisters will definitely have to try this out 🙂 Thank you! I am going to make this for our cookie, bar bake off at work next Monday. Thanks so much. These look ridiculously good. I need to make them asap. Yum, yum, yum!! Will be trying this recipe out! I really want to make these but my grocery store does not carry pumpkin puree… can i use regular pumpkin? Canned pumpkin works just fine, if that’s what you’re asking. Are you in the US? If so, canned pumpkin should start appearing on shelves soon! where do you buy white chocolate almond bark? Most groceries should carry it, especially as we approach the holidays. It’s in the baking section, and basically it’s a big brick that is sectioned into cubes. It is specifically made for melting & dipping. Here’s a link to it on Walmart’s website. That’s the chocolate variety, but you get the point. do these need to be refridgerated? how long do you think they will keep? Yum! I have most of these ingredients already! I can’t wait to make them. Combines my hubby’s two favorite things. Pumpkin and white chocolate. Hmmm… Did you use canned pumpkin puree or homemade? I know homemade puree tends to be more moist. One option is to line a colander with paper towels, and dump the pumpkin puree into there, and press the water out using paper towels. I’ve done that in the past with canned pumpkin when I’ve used pumpkin that I froze. For some reason freezing and later thawing pumpkin brings a lot of water to the surface. Another option would be to up the amount of cookie & graham cracker crumbs. I’m so sorry to hear they ended up in the trash! I hope that helps! These look wonderful! My former boss at my old jo used to make homemade pumpkin fudge each Christmas, which I have missed since I moved away. These remind me of her candy–can’t wait to make them! Thanks for sharing this. My son has a severe nut allergy and I wanted to know if there is anything that can be substituted for the Almond bark? Double check the ingredients list at the store, but I am almost positive there are NO nuts in almond bark. I have no idea why it’s called “almond” bark, but it is. You might see it called “coating candy” or “coating chocolate”. Now, it may be processed in a factory that handles nuts, but that probably varies by brand. If you absolutely have to avoid, then you can use white chocolate chips with a bit of shortening mixed in. Without the shortening, the white chocolate will not melt smooth enough. Approximately 30, depending on how large or small you roll them. Making these for Thanksgiving car ride!! By the way, you weren’t kidding about your photography– nice before, but FAB now. Do you mind my asking what changed and how your images are SUPER crisp now? My original pics were taken with my point & shoot camera. I have since upgraded to a digital SLR. A Canon 40D specifically. Plus with years of practice, my technique has also vastly improved! WOW, I made these last night and they are my NEW FAVORITE!!!! Thank you for posting!! Happy Holidays. You had me at PUMPKIN!!!!!!! YUM!! These look amazing and am trying them tomorrow. They just went to the very top of my TO TRY list! Are you allergic to the white almond bark? If not, you sub that for the white chocolate that goes in the filling. Another alternative is yogurt baking chips. I don’t have personal experience with either of these substitutions, but they seem like they would definitely work for the filling. I’m not sure how those yogurt chips melt down, so if you’re allergic to almond bark as well I don’t know how well that would work for the coating. That’s the best I can do, please let me know if you try either of these! Erin – Love pumpkin anything, so I want to try these. However, recipe sounds like they would taste more chocolatey than pumpkin. Seems like a really small amount of pumpkin puree. But, I’m no chef, so I guess I could try them and see. I’m thinking of drizzling the chocolate on them, vs. dipping. Hmmmm. I want to say that I am very unhappy with the pictures and recipe you have provided. Now I have to go and get some paper towels to wipe up the drool from my key board! This looks similar to oreo bites… a time consuming but ultimately DELICIOUS dessert. I plan to make this later this fall. Can.not.wait. Thanks for sharing!! You shouldn’t have any problem using fresh, but if I were you I’d try to strain as much water out of the fresh pumpkin as you can. Good luck, and enjoy! I have no idea where you live, but I would try looking at Whole Foods, or any chocolate shop. I absolutely share your love of everything pumpkin! I also love white chocolate! I think I am going to substitute my Velata Belgian White Chocolate flavored with maple for the the almond bark. Both sound absolutely delicious!! I think I can already smell them just by reading the ingredients! Can’t wait to make these! Thank you! I am definitely trying these! I love making “cake” balls so this will be a different treat. I use tooth picks to dip mine in chocholate. It’s quicker and only leaves a small hole in the top that’s easy to cover up. Do these truffles freeze well? My guess is they probably do. I froze them before dipping them in the white chocolate. But that was only for a few hours. Loved these, the recipe said it would make about thirty, mine only made about 15 when I was finished so I double the recipe and made it again. Came out delicious! Thanks a lot!